Today, I was convinced by comrades in the struggle to rescind a decision I had taken ten years ago never to bow before the General Court Martial as an advocate following the horrible treatment I was subjected to by the then chairman of the General court martial, Gen. Elly Tumwine during the perfunctory trial of Dr. Besigye in 2005. On the cool morning of that fateful day, I entered the General Court Martial premises in Makindye duly robbed as one of Besigye’s counsel but emerged out in the afternoon as a convict. It all happened when, in the course of the proceedings, I rose up to make submissions but was bundled into the dock where Besigye was standing, summarily tried on tramped up charges of contempt of court, convicted and sentenced to a fine of Ug. Shs. 1000= or imprisonment for a period of 2 weeks. Today’s proceedings in respect to the trial of Gen. Ssejusa were reminiscent of the said experience, save that the current chairman of the General court martial, Major Gen. Levy Karuhanga was relatively civil as he did not overtly persecute the defence legal team. But for all intents and purposes the whole process was nothing short of a mockery of justice. Little wonnder that not even a single ruling was made on any of the oral applications made. In short, we just escorted General Ssejusa to Luzira remand prison. It’s even a misnomer to call that kangaroo tribunal a court. I regretted why I cancelled my journey to Mbarara for our defiance campaign. What, however, brought a little smile on my face was the powerful message General Ssejusa sent out to President Museveni as he reminded him that the dungeon in which he was detained for the last two days is directly opposite the infamous Cell of no return where Iddi Amin confined him incommunicado in 1976 but his spirit to fight for good governance was never dampened. I hope The likes of Gen Kaihura, Tumukunde and their ilk will learn one or two things from this message. FOR GOD AND MY COUNTRY. “The head of the Private Security of the former Prime minister and Independent candidate, Amama Mbabazi has gone missing. The Go Forward campaign team allege Christopher Aine has been kidnapped” (NTV Uganda, 2015). UK & U.S., CSO’s and Multilateral Organizations statements and press releases on the events in Burkina Faso, West Africa. If you haven’t heard what has happen in Burkina Faso. If so, then these pieces will give you some notion on what has happen in Burkina Faso and also how it’s been and also what has happen in the last 48 hours. “The Secretary-General is following with great concern the deteriorating security situation in Burkina Faso. He calls on all parties to end the use of violence, exercise calm and restraint and use dialogue to resolve all outstanding issues”(…)”The Secretary-General is saddened over the loss of life resulting from recent events. He has requested his Special Representative for West Africa, Mohammed ibn Chambas, to visit Burkina Faso tomorrow and welcomes that this mission will be undertaken jointly with the African Union and ECOWAS [Economic Community of West African States]” (UN, 30.10.2014). “The United States welcomes President Compaore’s decision to withdraw a National Assembly bill which would have amended the constitution and allowed him to run for an additional term of office. We also welcome his decision to form a government of national unity to prepare for national elections and to transfer power to a democratically elected successor. We look forward to that transition taking place in 2015. We regret the violence and the loss of life today in Burkina Faso, and call on all parties to avoid further violence. We underscore our commitment to peaceful transitions of power through democratic elections and emphasize neither side should attempt to change the situation through extra-constitutional means” (Psaki, 30.10.2014). “Authorities in Burkina Faso must rein in security forces that have used excessive force to crack down on peaceful anti-government protests, Amnesty International said today” (…)”he use of excessive force to crack down on peaceful protesters is unacceptable and the transition authorities must act urgently to rein in security forces,” said Gaëtan Mootoo, Amnesty International’s Researcher for West Africa” (…)”It is crucial that those responsible for the killings and beatings of protesters, journalists and other civilians are identified and held accountable. Officials at the highest level should publicly make it clear that excessive use of force will not be tolerated,” said Gaëtan Mootoo” (…)”People took to the streets of Ouagadougou and other cities yesterday to protest against an attempt by President Blaise Compaore – who has since resigned – to amend the constitution to extend his long stay in power” (…)”They began beating them with cords, then they shot live bullets. I saw three protesters fall down in front of me. One protestor was shot dead. I was able to take a photo showing the bullets that killed him when he was shot in the chest,” he said” (…)”Protesters should not be detained and charged for peacefully exercising their right to freedom of expression and assembly, as guaranteed by the constitution and international and regional treaties ratified by Burkina Faso” (31.10.2014, Amnesty). “The African Commission on Human and Peoples’ Rights (the African Commission) is closely monitoring the political and human rights situation in Burkina Faso, in particular since the first demonstration that took place on Tuesday, 28 October 2014 to protest against the bill to amend the Constitution” (…)”is concerned about the worsening political crisis and its disastrous consequences for the stability of the country” (…)”is deeply concerned about the acts of violence and vandalism which led to the burning of the National Assembly building and destruction of the property of the national television station leading to an end to its broadcasting activities”(…)”is concerned about the death of several people during clashes between the population and security forces”(…)”is concerned that the violence is inconsistent with the ideals of democracy which is the goal of the demonstrations”(…)”The African Commission strongly condemns the violence and urgently appeals for a return to calm and a restoration of order. The African Commission reiterates the need for all the parties concerned to work towards restoring peace and security, and calls on the political stakeholders to engage in dialogue towards maintaining stability in the country. The African Commission seizes this opportunity to urge all the parties to comply with the principles of international humanitarian law and to respect and protect the human rights of all persons in Burkina Faso” (ACHPR, 31.10.2014). 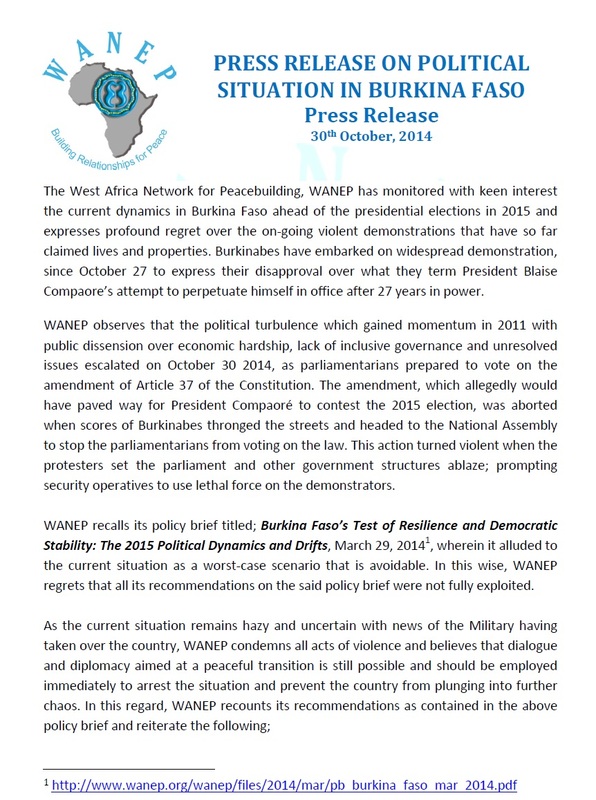 “Has followed with grave attention the events unfolding in Burkina Faso and the tension around the process leading to the consideration of the draft bill on constitutional amendment” (…)”takes note of the decision by the government to withdraw the passing of this draft bill” (…)”To this end, it reiterates the need for compliance with the principle of democracy and constitutional governance as stipulated in the ECOWAS protocol on democracy and good governance” (…)”ECOWAS calls on all the people to remain calm and law abiding, and the security forces to respect and act in accordance with the constitution of the Republic. It also calls on all the parties involved, notably the entire political class to embrace dialogue with a view to arriving at a political consensus that will lead to free, fair and credible election consistent with constitutional provisions. ECOWAS, in line with its principle, will not recognize any ascension to power through non-constitutional means” (…)”H.E. John Dramani Mahama, Chairman of the Authority of Heads of State and Government of ECOWAS” (31.10.2014, ECOWAS). Tobias Ellwood the Minister for Africa said: “We are deeply concerned by the violence which has taken place in Ouagadougou, seemingly as a result of government plans to amend the Constitution of Burkina Faso so that the incumbent President can seek another term after 27 years in office” (…)”The UK reiterates its support for the African Union Charter and for peaceful and democratic transfers of power. We urge all parties to exercise restraint, to adhere to non-violence and to return to dialogue to resolve this issue” (31.10.2014, UK).